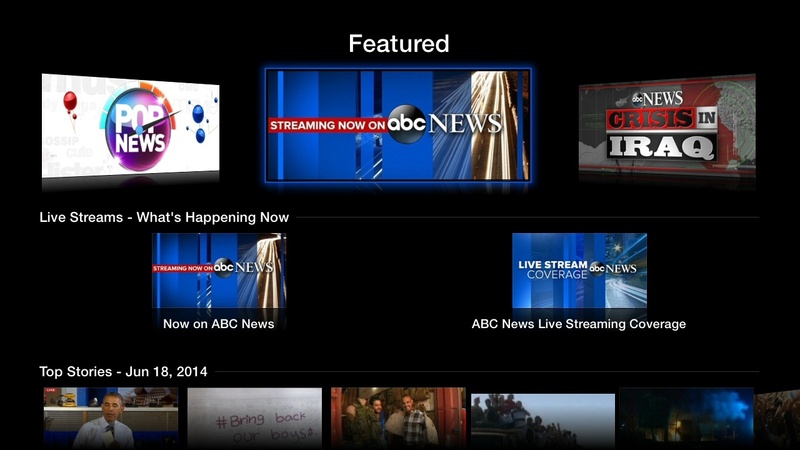 Apple (S AAPL) TV owners just got access to more news content, thanks to a new app from ABC (S DIS) News. The app, which launched Tuesday on the device, promises live hourly news updates and breaking event coverage through a total of four live streams. The app also offers local news content from ABC affiliates in select markets including Los Angeles, New York and Chicago. At launch, users will be able to access local content from a total of nine local ABC stations, and there are plans to add content from additional affiliates in the coming months. However, don’t expect complete live access to ABC Nightly News or Good Morning America. The app will only offer select video highlights of its most popular shows. The upside is that viewers won’t have to log in with their pay TV credentials, meaning that even cord cutters are welcome. I guess if the largest stock holder of Walt Disney ABC Corporation tells you to do something you do it. Steve Jobs widow has 7.7% of Walt Disney ABC stock held in trust so if they tell ABC or Disney to release Apple only products or early releases as in the case of the Frozen movie you do it. Also ABC News stations always promote Apple products at any opportunity. Just good business you know. Sadly, none these are available in Japanâ€”Apple yet again “forgets: Apple TV services for its international customers. Some solid additions here. Apple has been very aggressive lately with adding content. Let’s see where they take the Apple TV in the near future.